Gestational Diabetes Mellitus (GDM) is a condition in which the blood sugar levels increase to various degrees during pregnancy. GDM occurs due to decreased and hence inadequate insulin supply, to meet the tissue demands for normal blood glucose regulation. This condition should be immediately detected through a test in order to avoid gestational diabetes complications in the mother or the fetus. The gestational diabetes test helps detect if an expecting mother has acquired diabetes during pregnancy. 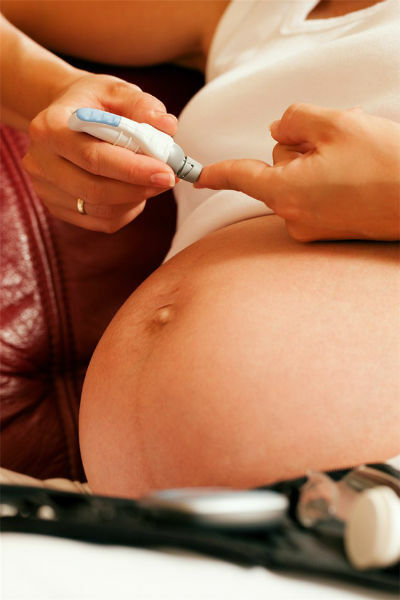 During pregnancy, it is important to undergo blood glucose screening at the initial antepartum visit. If this step has been omitted for any reason, it is wise to have your blood glucose tested as soon as possible. It is advised to get your blood sugar tested between the 24th and 28th weeks of pregnancy, if you were not diagnosed with Gestational Diabetes Mellitus during previous prenatal checks. This is just a screening process that will help you be sure of your physical condition. The American College of Obstetricians and Gynecologists recommends screening for GDM during the initial prenatal visit, for women in the high risk groups. This test is mainly a 50 gram oral glucose test performed in the patients with high risk factors. It does not need any prior preparation and can be done at any time of the day. The blood glucose level is measured one hour after the test. If the blood glucose levels are ≥ 140 mg/dl or ≥ 7.8 mmol/l, an oral glucose tolerance test is carried out. This gestational diabetes test is recommended by the American Diabetes Association. It is carried out during the early prenatal visits in the case of women from high-risk groups, and sometime between the 24th and 28th weeks of pregnancy in others. The values shown in the table indicate a positive glucose tolerance test. If you test positive for gestational diabetes, treatment measures will be started immediately to avoid complications in both your health and the health of the fetus. These treatment measures include framing a right diet for gestational diabetes and the administration of insulin. While some women face a higher risk of suffering GDM, this condition can occur in any woman during pregnancy. For this reason, it is highly recommended that pregnant women undergo the gestational diabetes test, to avoid harm to themselves as well as their fetus and ensure the birth a healthy baby. This entry was posted in Gestational Diabetes and tagged gestational diabetes screening, pregnancy diabetes test by Dr. Kiran Kishore. Bookmark the permalink.